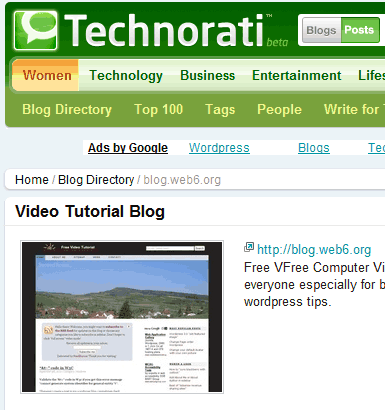 Technorati blog review was used to be easy. When this blog was still a few weeks old, after doing some SEO basic research, i was convinced to submit this blog to high rank blog directories. And i did submit my blog, and the claim evaluation went well and fast without any problems. See this blog’s detail in technorati. As you notice when you clicked that link, you will see that my blog is listed without www. So the URL link is http://blog.web6.org. I will tell you my story later on in this post, keep on reading.. Honestly i almost forgot how i did it, but as long as i remember it was very easy and self explanatory after you are logged in to Technorati, and follow the instruction how to get technorati blog review to your site. I might make a tutorial about it, so feel free to subscribe my feed if you like to. What is the benefit of applying technorati blog review. Everyone who is active in blogging world know Technorati, very trusted blog directories that if your blog feed is listed there, whenever you create a post, it will be crawled or indexed very fast. Of course doing technorati blog review won’t give magic but it is also a great help. How my blog is listed, but without www. Technorati blog review also gives you a blog ranking, and because it is trusted by Google, technorati is important for new blogs to get more authority and exposures from another blogs or advertiser. By ranking well in Technorati, you will also gain technorati’s traffics since it is one of high traffic blog directories. To get better ranking in Technorati or other search engines, i am using and recommending wordpress bloggers to try my best SEO plugin to guide you how to increase your keyword density for your blog post in order to be in the first or second page of Google. When people find your blog useful and worth to spread around, it will give you benefit, both your blog’s popularity and traffic, as well as advertiser. Technorati blog review- how long does technorati blog review take? As mentioned in my first paragraph above, for the first time i submit this blog for technorati blog review, the whole process is very easy and self explanatory. And finally, my blog was listed. At the time when i submitted i register my blog for technorati blog review with its first URL address: http://blog.web6.org (notice it has no www). Until today, it is still listed in technorati blog review that way, because i could not edit the URL. I could only resubmit with its current URL address, which is with www, but i failed.. (Update: I resubmit my blog again,and it needs 8 days until its complete)..
See this new screenshot of this blog in Technorati. Don’t give up submitting your blog, once its rejected, submit again and be patient. The answer on how long does it take technorati to review site or blog is very fast, mine took about two until three weeks. But it has been changed now, it may take longer depending on your site content. My advice would be, after you submit your feed, and get this message; “Technorati your claim is now awaiting review” forget your submission, and continue submit to another directories until your site is listed. I have seen and read many forum threads, that tons of new blogs are not accepted in Technorati. Many reasons i have heard, that technorati blog review is nowadays harder to get, especially if your blog’s content is not qualified. Thanks for the post Kimi. I had just joined Technorati and waiting for my blog to be added now. I didn’t remember to add the code in my post so I’m gonna have to wait until my next post to get it approved. Nice article! I submitted my blog like a month ago, and it is one month old. I totally forgot about Technocrati until yesterday… When I logged in, I saw that my blog was accepted (but I only started to get in directories yesterday…). And my rank is around 24 thousand. Could you please tell me, is that a good ranking? I didn’t found anything regarding what counts as bad. Or could you recommend a site, where I can inform about technocrati, and techniques to rank better on it? Thank You for this information. I just googled how long it takes for technorati to review your claim and my first link took me to you. Thanks again so very informative and easy to understand. You rank No.1 for “how to get a blog quickly reviewed at technorati”, nice job mate ! Am too awaiting for the approval past 3 days now. I just read somewhere that you have to post the claim token somewhere. Is that true ? But yes, this is true, you have to paste the token to your latest post, so it will be on the rss feed. Technorati will fetch it, once it is fetched, Technorati will email you, to tell that you can remove the token away..
Got it through, posted the token to a fresh new post, awaiting a reply from technorati. Thanks for the post, I noticed in the comments that people are waiting until they post a new blog to add the code. You can make a blog post that only has the code as it’s title and the code as it’s content; it’s just to verify that you are the owner of the blog. This is proved whey you log into your blog site and post the code. That’s all that’s required. The question of how Technorati chooses between one blog and the next is a different point. how many blogs we add on technorati at same time?